Back and Posture Care | Health Articles | Back Health- Are You Sitting Comfortably? This article has been viewed 14090 times. Traditional seating posture i.e. upright, can increase kyphosis , an outward rounding of the lumbar region of the spine. In an upright 90° sitting position you bend your hip joints and rotate your pelvis axis backwards, flattening the lumbar curve and straining the muscles of the back. When leaning forward you have to bend further and this bending takes place mainly in the 4th and 5th lumbar discs, so a lumbar/back support on a traditional chair will hardly have any influence on your posture when leaning over to work. In terms of posturally healthy sitting and maintaining a healthy spine we should avoid kyphosis in the low back and maintain a moderate level of lordosis (the natural or inward curvature of the lumbar region of the spine). This means incorporating the natural curves of the spine into our seated posture. WHAT ARE THE NEGATIVE EFFECTS OF TRADITIONAL SEATING? Traditional Seating increases an outward rounding of the spine and spinal posture tends to collapse. As the back bulges out you get a rounding of the lower back that may also encompass shoulder, neck and back muscle tension and misaligned vertebrae. Blood circulation in the lower body weakens, possibly leading to varicose veins, cellulite, bloated feet and fatigue. HOW DOES A SADDLE SEAT WORK? Saddle Seating maintains the natural inward curvature of the spine to create the optimum balanced posture. 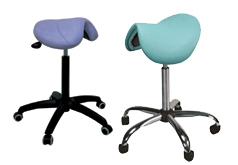 A Saddle Seat is designed to promote optimal seated posture. Sitting on a Saddle Seat properly positions and stabilises the pelvis automatically relieving stress on the lumbar discs and spine. The Saddle shaped seat gives maximum support and maintains your natural spine curve by keeping your pelvis rotated forwards and your back hollow and permits the pelvis to be held securely in its natural position so that, when leaning forward to work, the lean is from the hips and not the waist. With the Saddle Stool there is no need for lumbar support because the correct lumbar curve is maintained naturally rather than artificially. HOW WILL SITTING ON A SADDLE SEAT BENEFIT ME? IS THE SADDLE STYLE OF SEATING EASY TO GET USED TO? The Beautelle Saddle Seat is comfortable, and provides a wide range of adjustments to help the individual find the most natural, comfortable sitting position. Tight skirts are not possible due to the wide stance required. There is a short transition period while your body adjusts to a totally different way of sitting and the 'equestrian' style of posture. This may include some sore muscles for a few days. Users usually find that they are fully adapted to the Saddle within two weeks. Users tend to find posture problems are alleviated after only a few weeks of use. WHO DO YOU RECOMMEND USES A SADDLE STOOL? The opinions expressed in this guide are that of Beautelle and are intended to be used purely as a reference guide only. All statements are our in-house therapist's (qualified in Anatomy & Physiology) own interpretation of available research documents and/or through consultation with qualified practitioners & professional medical users. Information given is in good faith and every care is taken to uphold the accuracy, however errors and omissions are excepted. • Back Health- Are You Sitting Comfortably?